George Soros previously called cryptocurrency a "bubble" and referred to it as a tool for dictators to hide their money, now him and multiple other global elites are joining in on it. This week, it was reported that multiple high profile banking interests were moving into the cryptocurrency space—most notably, George Soros, the Rockefellers, and the Rothschild dynasty. According to Bloomberg, Adam Fisher, who is in charge of Soros Fund Management is preparing the firm for cryptocurrency trading. The firm has yet to make a purchase or an official statement, and a spokesperson has declined to comment on the matter. This move was surprising to some, as Soros has been critical of cryptocurrency in the past, calling it a “bubble” and even a tool for dictators to hide their money. “As long as you have dictatorships on the rise you will have a different ending because the rulers in those countries will turn to Bitcoin to build a nest egg abroad,” Soros said. Ironically enough, one of the best uses of cryptocurrency is for people to hide their money from dictators to avoid confiscation and taxation. Also last week, Bitcoin.com reported that the infamous Rockefeller dynasty has made moves into the world of crypto. The Rockefellers are well known for their heavy influence in global politics, education, media, banking and oil, and are often viewed as corrupt ruling class figures. Venrock, the Rockefellers’ venture capital firm, announced that their first partnership will be with Coinfund, an investor group for cryptocurrency startups. Oddly enough, Pakman went on to say that cryptocurrency is a technology that bypasses gatekeepers, despite the fact that his company is owned by the ultimate gatekeepers. 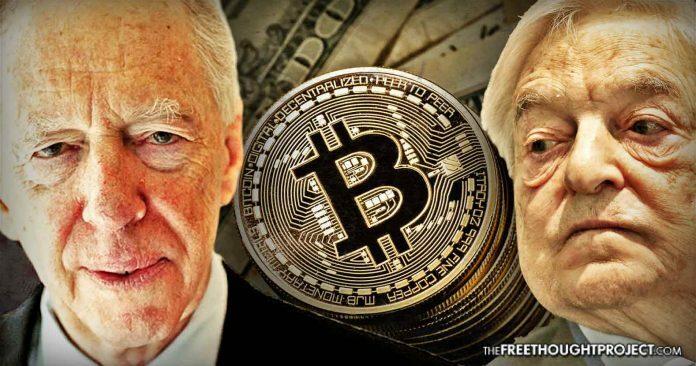 What’s more, as RT recently reported, the Rothschilds, also known for their close ties to banks and other financial institutions, have stepped towards cryptocurrency trading as well. In December, the family reportedly purchased bitcoin exposure via the Grayscale Bitcoin Trust for the first time. In the past several years, bankers have been constantly changing their opinions on cryptocurrency—bashing the technology one minute, and then praising it the next. Now it seems that big banks want to cut their customers off from crypto purchases, while at the same time implementing blockchain systems with their existing business models. Bank of America CEO Brian Moynihan recently claimed that the company has more patents than anyone else in the blockchain space. Moynihan shares the sentiments of many in the banking industry who hate anonymous cryptocurrency, but see potential in the blockchain technology that makes it possible. As with any technology, this is a tool, which could be easily used in our favor or against us. As I have pointed out many times in the past, this is why the battle for the blockchain and the race to innovation is so important. Early Bitcoin adopter Andreas Antonopoulos compares the general attitude that the banking industry has towards cryptocurrency to the “five stages of grief,” a popular psychological model used to describe the emotions that people go through when they experience some type of loss. These stages are denial, anger, bargaining, depression and acceptance, usually in that order. His analogy seems fairly accurate. First, the establishment entirely denied the existence or legitimacy of cryptocurrencies. Next, they went into the anger phase, where they did their best to associate crypto with crime and terrorism, even going so far as to lock up some of the most prominent figures in the space. Now, as Antonopoulos points out, it seems that we have entered into the “bargaining phase” where the banks will try their best to co-opt the technology in a desperate attempt to stay competitive and relevant. “Denial happens with all innovative technologies. The desire to dismiss change. Bitcoin was irrelevant. Then it wouldn’t die, then it was scary and dangerous… The new ‘line’ is that blockchain technology is promising. Now we’re in the ‘bargaining’ stage,” Antonopoulos said. Luckily, the blockchain is a battlefield where those who are fighting for freedom, actually have an upper hand on those who are fighting against it. The developers who are seeking to build anonymous and decentralized platforms are more skilled and knowledgeable than the old money that is entering the space. Let us hope that the next stage “depression” is for the bankers, and not for us.